This small charming hotel has a total of 14 rooms, all with views of the sea and the village, of which 10 are double rooms, 3 junior suites and 1 luxury suite. The house is a large Catalan Masia, or farmhouse built in 1768. We are surrounded by working farms and vineyards with fine views of the medieval town of Peralada 1Km away. Peralada is famous for its wine and annual arts festival held each year in July and August in the grounds of the castle. Festival de Peralada. Can Carbo sits in a hectare of woodland and meadow garden. There are eight large bedrooms within an enclosed courtyard which have been created from the original farm buildings. Wine, olive oil,dairy products and livestock have been produced here for hundreds of years. Hostal Casa Clara , in the historic centre of the mediaeval village of Castelló d’Empúries, is a simple, family oriented inn with seven bedrooms, all of which have different designs. It is located in an unbeatable setting, in the middle of the three natural parks in the region, with endless routes for those who enjoy hiking and cycle tourism. Its proximity to the DO Empordà wine cellars makes it a great place for wine tourism. At Hotel Peralada, in the heart of Alt Empordà, every detail is a gift for the senses. An exclusive and unique hotel, discover an authentic experience for the senses. There’s a place where nature merges with the soul to create an unforgettable stay. Enjoy Mediterranean haute cuisine, an exclusive wine spa, an idyllic golf course and the liveliest cultural hotspot on the Costa Brava. Experience an exclusive stay in one of our 62 exquisitely-decorated rooms with all the comfort you need to relax in a beautiful, tranquil setting. Our chefs wisely combine the culinary tradition with creative haute cuisine in the most exquisite way. Enjoy our original rice dishes, fish suquets and our delicious surf and turf options, in one of our 4 Restaurants. The Wine Spa, an unbeatable sensorial experience. A sanctuary of relaxation based on the properties of wine. Relax the senses in a paradise of wellbeing that recovers the ancestral legacy of wine therapy. Playing at Golf Club Peralada is more than just golf. It’s about enjoying a unique experience in one of the best golf courses on the Costa Brava that blends into a beautiful Mediterranean landscape. 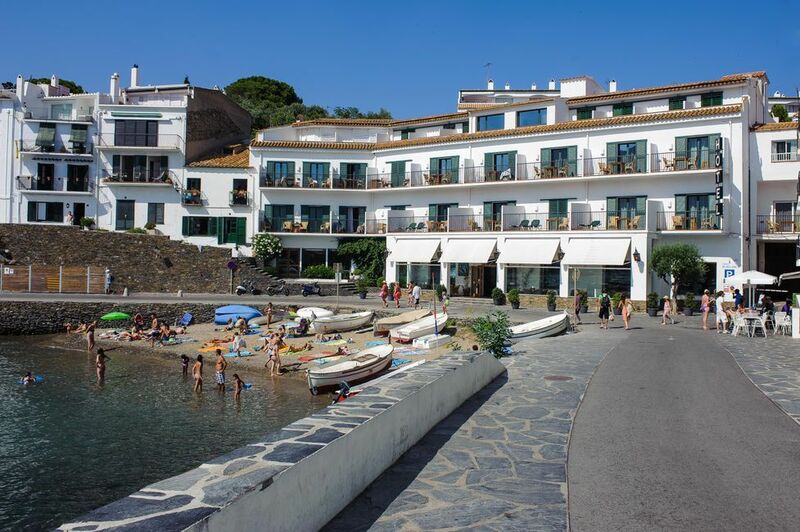 This modern, comfortable hotel is set in the bay of Cadaqués, in a quiet, sunny bay with one of the best views in the area. At Playa Sol you can enjoy the garden and swimming pool with a summer restaurant, and its rooms have terraces, satellite TV, air conditioning and heating.